Although beauty is in the eye of the beholder, how many times have you walked through a resort and been blown away by the walkways and tile? Have you marveled at the intricate designs or different shades in order to create a beautiful path? How many times have you taken pictures and saved them for your “Household Ideas File”? Welcome to the intricate world of pavers and tile. According to different sources, interlocking pavers have been around for about 5000 years. Built over a compacted stone sub-base and a leveling bed of sand, they were used in roads, walkways and the like because they could withstand temperature differentials better than other materials. As they are laid, there is space in between so that during extreme cold or heat, they can move without affecting the line of the path that they have paved. As they naturally shift to acclimate to the weather, they don’t crack like cement sidewalks. As an added bonus, the “spaces in between” affect water drainage because when the water hits pavers, it follows the seams to drain away without creating annoying puddles. Paver and tile design can be a little overwhelming because there are so many choices. Tropical Pools and Pavers can help you pick the right colors and the right design. You can mix and match tiles based upon different focal areas that you want to create. 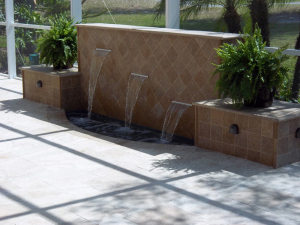 If you want a pool with a rock waterfall feature, you can match the pavers to the stone that you use in the waterfall. But don’t stop there, because you can also create special patterns in the pool tile or pavers that sets off the beauty in the waterfall. Although pavers require very little maintenance, you might want to have them sealed to ensure that they retain their color and beauty. Although pavers are designed as a natural element, their colors can fade over time due to the heat. Tile also does not require a lot of maintenance (although we did write about how to clean calcification in an earlier blog), and based upon your pool design, can be changed over time as your tastes change or if you want to update an existing pool. 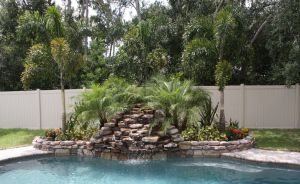 At Tropical Pools and Pavers, we install beauty and durability to create your backyard paradise. If you have any questions regarding a new pool design, a walkway or how to update your backyard, please feel free to contact us at 727.474.2142.